A 40-year-old female presented with a gradually increasing, painless swelling, over the mastoid region, since three years. 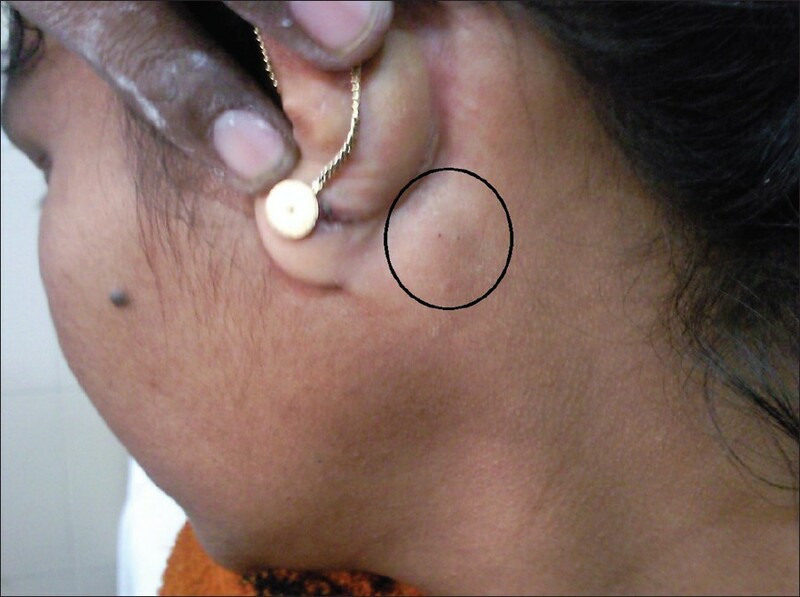 Physical examination revealed a 1.2 cm, firm nodule, involving the skin and subcutaneous tissue [Figure 1]. Fine needle aspiration cytology (FNAC) was requested without any provisional clinical diagnosis. The salivary gland appeared normal. Fine needle aspiration cytology was done with 22 G needles. Two-to-three passes of the needle yielded a thick and mucoid aspirate. The smears were prepared and stained with May-Grunwald-Giemsa (MGG) and Haematoxylin-Eosin stains. The cellular smears showed a biphasic component-cellular and stromal elements. The cellular elements were composed of bland epithelial cells embedded in a fibrillary chondromyxoid stromal matrix [Figure 2]. The epithelial cells were small and monomorphic, with round-to-oval, centrally located nuclei, evenly dispersed fine chromatin and a moderate amount of cytoplasm. The cells were arranged in sheets and loose clusters with a few single cells [Figure 3]a. The elongated myoepithelial cells were embedded in a chondromyxoid matrix [Figure 3]b. A diagnosis of CS was made and a histopathological examination was advised. Under local anaesthesia, total excision of the lesion was performed, with disease-free margins. Grossly, the relatively well-circumscribed, small, epidermal tumour measured 0.9 cm in diameter. Microscopy revealed two components of the tissue. One component was made up of epithelial cells arranged in tubules, ducts and nests [Figure 4]a. They formed interconnecting tubuloalveolar structures lined by a single layer of cuboidal epithelial cells [Figure 4]b. The other component was made up of chondromyxoid stroma, intermingled with nests and branches of cuboidal epithelial cells [Figure 4]c-d. 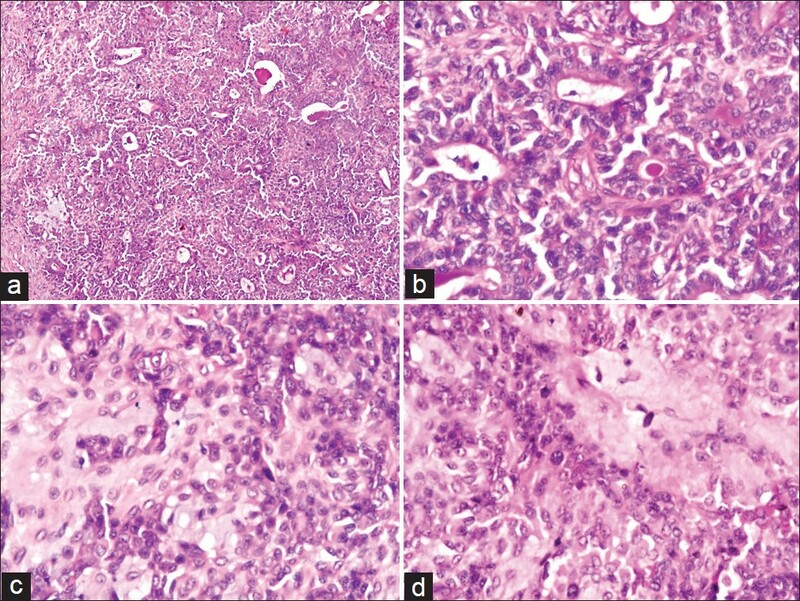 The histological findings were consistent with the benign mixed tumour of the skin - eccrine variant of chondroid syringoma. The patient was well after excision and no recurrence was reported on a two-year follow-up. To conclude, CS is often overlooked because of its rarity and unremarkable clinical presentation. CS is rarely aspirated. Awareness of the cytological features of CS is required in order to provide correct diagnosis and management. CS must be considered in the differential diagnosis of any small subcutaneous nodule in the head and neck region, in middle-aged patients. The treatment of choice is total excision, with wide disease-free margins, to rule out malignancy and reduce the risk of recurrence and malignancy in future. 1. Dubb M, Michelow P. Cytologic features of chondroid syringoma in fine needle aspiration biopsies: A report of 3 cases. Acta Cytol 2010;54:183-6. 2. Tokyol C, Aktepe F, Yavas BD, Yildiz H, Aycicek A. Chondroid syringoma: A case report. Acta Cytol 2010;54:973-6. 3. Hirsch P, Helwig EB. Chondroid syringoma Mixed tumour of skin, salivary gland type. Arch Dermatol 1961;84:835-47. 4. Skoro M, Ostoviæ KT, Cikara I, Müller D, Novak NP, Virag M. Fine needle aspiration cytology of chondroid syringoma. Coll Antropol 2010;34:687-90. 5. Agrawal A, Kumar A, Sinha AK, Kumar B, Sabira KC. Chondroid syringoma. Singapore Med J 2008;49:e33-4. 6. Yavuzer R, Baºterzi Y, Sari A, Bir F, Sezer C. Chondroid syringoma: A diagnosis more frequent than expected. Dermatol Surg 2003;29:179-81. 7. Mishra K, Agarwal S. Fine needle aspiration cytology of malignant chondroid syringoma: A case report. Acta Cytol 1998;42:1155-8. 8. Sun TB, Chien HF, Huang SF, Shih TT, Chen MT. Malignant chondroid syringoma. J Formos Med Assoc 1996;95:575-8.